With all the hours you spend at your job, it’s normal if you feel stressed at work (and yeah, I say “if” knowing full well that you ARE stressed at work a lot of the time, if the numbers are right.) And if you’re TOO stressed, you’re at risk of burnout. Burnout is a leading cause of unnecessary job turnover, and yet it keeps happening because no one seems to know exactly how to handle it. Companies have few official resources for employees at risk of burning out, bosses don’t know how to address it, and employees worry that if they bring up their stress levels, they’ll be labeled “incapable” or “whiny.” Until we can address the ways our society has glorified stress as being a symbol of importance (I’m working on it, I promise! ), it will be up to individuals to speak up for ourselves in a way that doesn’t risk our career success. So how do you say “I’m about to burnout!” to your boss without committing career suicide? It might be best to not even say the word burnout to your boss. If you think your boss might judge you for being stressed, or be the kind of manager who doesn’t care about your mindset as long as work gets done, then you can have this conversation without ever saying “burnout.” Instead, bring up specific challenges you’re facing that are getting in the way of your success, like being interrupted too much, not having the information you need, etc. And did you know there are different kinds of burnout? 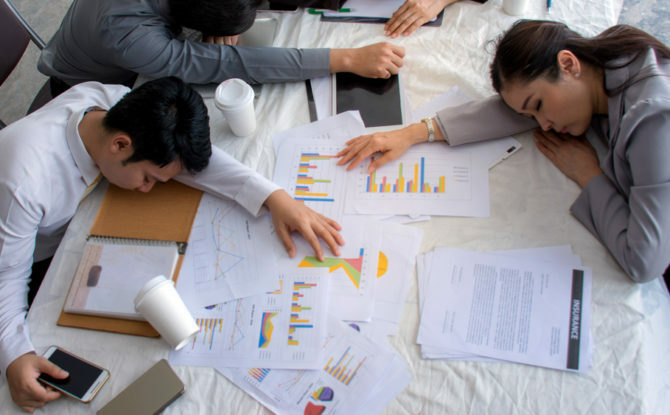 Psychologists say there are 3 burnout subtypes: “frenetic,” “underchallenged,” and “worn out.” So even if you say “burnout” or “stress,” your boss’s idea of what that means might be different from yours. So clearly articulate whether you need more help from colleagues, more time on deadlines, or whatever it is that will actually help you manage the situation. In this video about telling your boss you’re stressed without seeming whiny, I go over the two types of coping: problem-focused and emotion-focused. In the workplace, most bosses prefer problem-focused coping. So before you talk to your boss, prepare at least three possible ideas for making the situation better. By coming to the meeting with ideas already ready, your boss will see that you aren’t just looking for an excuse or a reason to complain, but that you’re actually looking for help at doing the best possible job. Your boss may have more suggestions for you, or be able to help you help you find the resources you need to implement your ideas. But by showing up with a plan, you’re showing positivity and a willingness to fix the situation. The odds are good that there are many issues causing you stress that are leading to your feelings of burned out. And it can be tempting to want to address ALL of them in this meeting. But when you’re on the verge of burnout, be aware that your brain isn’t operating at its best. If you try to address every single outstanding issue at your organization all at once, you might get distracted and fall down the rabbit hole, amping up your own irritation in the meantime. Stick to one or two main issues that are leading to your feelings of burnout. Issues that – if resolved – will clear up the majority of your frustration. Refer back to the list you made above, and your boss will hopefully get on board. Don’t let the risk of burnout drive you away from a job you enjoy. It’s possible to work hard without being burned out, so if you think you’re on the verge, talk to your boss sooner rather than later and make a plan that will keep you productive and successful.